Translational repression and degradation of transcripts by microRNAs (miRNAs) is mediated by a ribonucleoprotein complex called the miRNA-induced silencing complex (miRISC, or RISC). 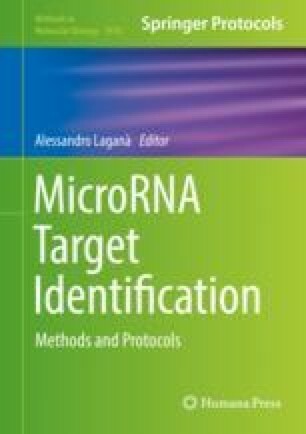 Advances in experimental determination of RISC structures have enabled detailed analysis and modeling of known miRNA targets, yet a full appreciation of the structural factors influencing target recognition remains a challenge, primarily because target recognition involves a combination of RNA–RNA and RNA–protein interactions that can vary greatly among different miRNA–target pairs. In this chapter, we review progress toward understanding the role of tertiary structure in miRNA target recognition using computational approaches to assemble RISC complexes at known targets and physics-based methods for computing target interactions. Using this framework to examine RISC structures and dynamics, we describe how the conformational flexibility of Argonautes plays an important role in accommodating the diversity of miRNA–target duplexes formed at canonical and noncanonical target sites. We then discuss applications of tertiary structure-based approaches to emerging topics, including the structural effects of SNPs in miRNA targets and cooperative interactions involving Argonaute–Argonaute complexes. We conclude by assessing the prospects for genome-scale modeling of RISC structures and modeling of higher-order Argonaute complexes associated with miRNA biogenesis, mRNA regulation, and other functions.